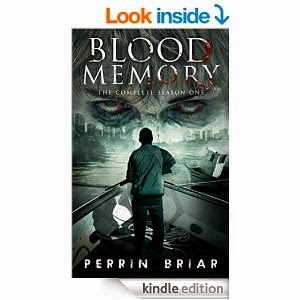 Blood Memory: The Complete Season One by Perrin Briar. Haven’s crew found Jordan Grant half-dead floating at sea. With a six-year hole in his memory, he remembers nothing of the Incident or the Lurchers who have claimed the land as their own. He joins the crew in their daily struggle to survive in a harsh new world where every meal is live or die. But when a shipwreck forces them from the safety of the sea, the crew soon discover their pursuers aren’t the only monsters out to get them. As Jordan confronts the horror of his past he unlocks a secret that threatens to destroy not only him but the future of the entire human race. I rather enjoyed this zombie novel. Normally books of this ilk are all similar in type but there was a small twist to this story that set it apart from most of the others. The story follows Jordan, a young man who is suffering from amnesia and can't remember the last six years of his life. He's found floating in the sea by a group of survivors who manage to fish him out. From there the story follows the group as they fight to survive in a world infested by zombies. What I liked about this book was that the zombies were not all lumbering oafs but some of them were sentient and that made the story take on an interesting turn. The author kept the sentences short and purposeful, which made the story flow quickly. Character development were done well and while the book was told through Jordan's perspective, the other characters had their share of growth. A big positive for me was the main character, Jordan. He was my ideal type of hero. Not too capable to the point of being boring, but not too weak to the point where your rolling your eyes. He made mistakes, had faults but did the right things at the right time. An enjoyable zombie book that is one of the better ones I've read this year. And I'll definitely be looking out for the next one in the series.